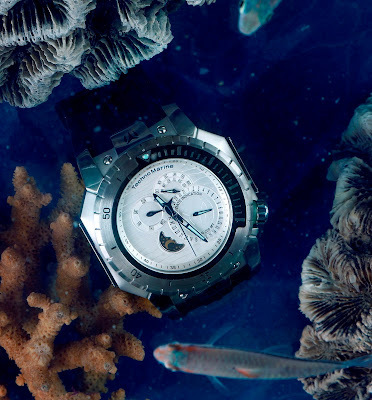 This summer, live larger and go deeper when you explore the wonders of the sea with the TechnoMarine Manta Sea watch. Ruggedly tough yet elegantly fashionable, the TechnoMarine Manta Sea timepiece is fit for any adventure, on the beach or underwater. Designed for recreational scuba diving, TechnoMarine Manta Sea is water resistant up to 200 meters. Its solid black silicone band and smooth Japanese components allow you to move without any restrictions. It also has luminous hands that help you see clearly even in deep waters. TechnoMarine Manta Sea is also perfect for an after-sunset rendezvous or an elegant dinner. This timepiece comes in a sleek 48.80mm stainless steel case with a metal dial, the ideal watch for those who are bold, adventurous, and dare to explore life’s depths. With every purchase of TechnoMarine Manta Sea and other top featured collections from April 1- 30, 2018, TechnoMarine is offering a packed summer getaway to one of the hottest dive spots in the country. The winner can spend an amazing summer holiday with three friends at Acacia Resorts and Dive Center, the premium go-to destination of divers in Anilao, Batangas. Make this summer the best one yet and take underwater dive experience to the next level with TechnoMarine. Visit any TechnoMarine store in Greenbelt 3, Robinson’s Galleria, Robinson’s Magnolia, Shangri-La Plaza, SM City Cebu, SM Lanang Premier Davao, SM Mall of Asia, SM Megamall, SM North Edsa, and TriNoma. For more information, visit https://www.technomarine.com/ or follow and like TechnoMarine on Facebook and Instagram: @TechnoMarinePH.